Remind your favorite student of how proud you are of them for all of their hard work. Our colossal chocolate chip cookie cake is baked full of chocolate chips and decorated with an adorable reminder to Study Hard, Snack Hard. Reward your special student with our Giant Study Cookie Cake. Our cake is freshly baked and filled with a generous supply of chocolate chips. It does not include nuts. 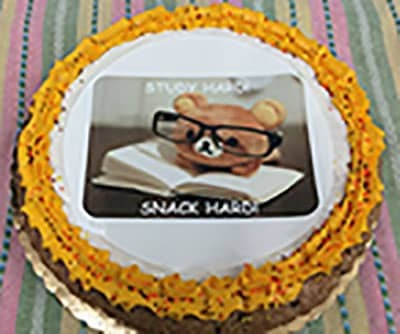 It is decorated with an adorable photo of a very studious little Teddy bear studying hard with a book, frosting border and a reminder to "Study Hard - Snack Hard".